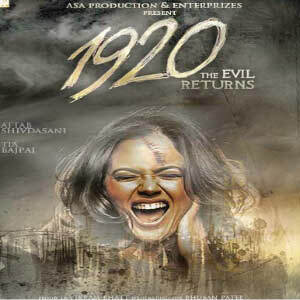 1920: Evil Returns is an upcoming Bollywood horror film written by Vikram Bhatt and directed by Bhushan Patel. The film is a quasi-sequel to a 2008 film 1920 , and stars Aftab Shivdasani, Tia Bajpai, Sagar Saikia in the lead roles. The film is under production stage, and is scheduled to release in November 2, 2012.. It was third in a series of quasi-sequels released under the Bhatt Banner including Raaz – The Mystery Continues, Murder 2, Jism 2, Jannat 2 and Raaz 3D each of which had nothing to do with their respective prequels, but somehow fell in the same genre following a similar story. The trailer had been released in sept 28 2012 and the first look is quite impressive. 1920: Evil Returns is a supernatural thriller which revolves around Jaidev Verma (Aftab Shivdasani), a famous poet who lives the life of a loner as he is unable to meet the love of his life. He stays with his sister Karuna (Vidya Malvade) who is his support system until he meets Smruti (Tia Bajpai), whom he finds near the lake under mysterious circumstances. Jaidev brings her home and takes care of her against the wishes of his sister, who doesn’t want Smruti to stay as she senses something wrong with her. During the course of time, Jaidev finds out that Smruti has lost her memory and does not remember anything from her past life except for his poems. Jaidev decides to take Smruti to Shimla to get her treated in a big hospital. On their way, while resting in a guest house, strange haunting sounds start to emanate. Smruti gets possessed by a spirit (Sagar Saikia)and goes out of control.